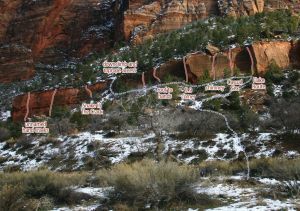 This is farthest up-canyon route on the cliff band and also one of the best-looking straight-in cracks from the road. Usually done as a toprope. Climb a sandy crack to the horizontal break halfway up. Climb out the bulge and continue up the hand crack to the ledge. The top out is loose; be careful! Which SuperTopo guidebooks include a topo for Practice Cliffs, Unknown Hand Crack Left?